The Walkerton Police Department is currently accepting applications for PART-TIME DISPATCH. Click here. A dispatcher is always on duty at the 24-hour Communications Center inside the police department, ready to answer all emergency and non-emergency calls for police, fire, ems, and utilities. Besides answering those calls and answering questions, the dispatcher communicates on at least 5 radio channels and routinely monitors over a dozen! Our dispatchers have a total of over 70 years experience! Every dispatcher must be an IDACS Certified Operator, trained by the Indiana State Police and also Emergency Medical Dispatch certified. New dispatcher training takes several months. -So why do we ask so many questions? Many callers do not understand why we don’t stop asking questions and just send someone. Our concern is to get responders to a scene quickly and safely. 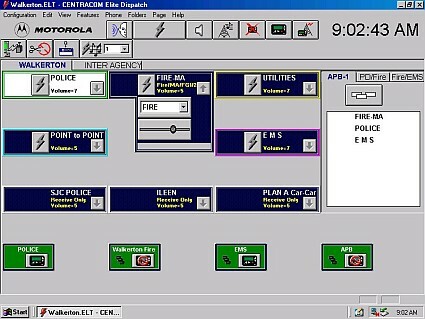 The dispatcher is trained to multi-task, asking medical or police-related questions from all types of callers and communicating it to emergency personnel over the radio in a professional way. It can make a situation worse just because the dispatcher did not ask important questions. A phone call usually seems to take a long time to a distressed caller, but it literally lasts about a minute on average. Taking a few more seconds to ask more questions helps the dispatcher avoid delays or even dangerous situations during the reponse. The best way you can help us is to briefly state the reason for your call and allow us to ask the questions. Sometimes on emergency or in-progress calls, it is necessary to keep the caller on the phone until help arrives. Please be patient; this eliminates the delay of sometimes having to call you back and get more information responders ask for. Of course you can always remain anonymous when you call, but having (at least) your phone number will enable us to call you back in case responders need additional information to get there.